When is The Unique LA Holiday Market in Santa Monica? December 15 & 16, 2018, Saturday and Sunday from 10am-4pm. Where is The Unique LA Holiday Market in Santa Monica held? 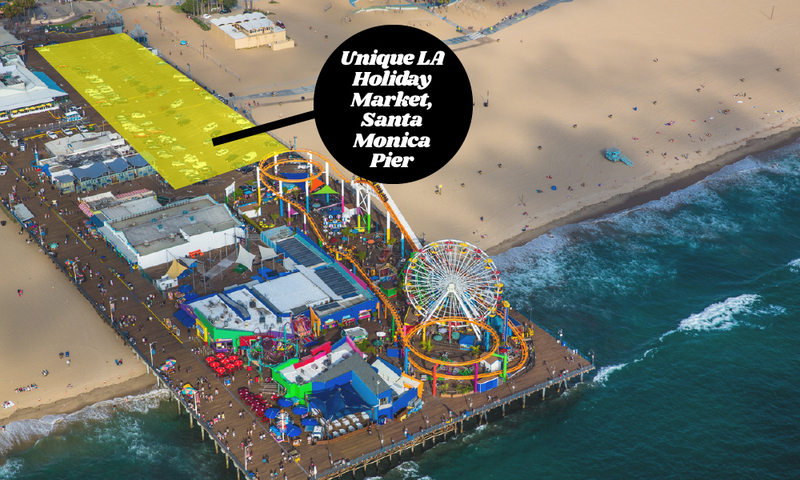 We are excited to share that the location is the beautiful, historic and very popular tourist destination The Santa Monica Pier. This is an OUTSIDE venue on the Santa Monica Pier, located where there are usually parked cars, on top of historic old wooden planks. The pier is located at 200 Santa Monica Pier, Santa Monica, CA 90401. When do vendors move-in and setup? Vendors must arrive early to set up on Saturday, December 15th (details will be sent to accepted vendors). Unlike the downtown markets, there will be NO early move in on Friday. What is included in a 10X10 Spot? At the Santa Monica Pier we will be providing one 6 ft banquet table, one chair, one umbrella, and one Unique Markets sign with your space number on it for easy way-finding. We do not provide linen. Remember this is an outdoor experience near the ocean so while it will be beautiful, please come prepared for wind and moisture. ****There will be no splitting/sharing booths.